Wash Off is a powerful Coral Cleaner for newly acquired corals such as Sps, Lps, Chalice, Zoas, Montipora, Mushrooms and more. Wash Off is made from 100% pure therapeutic grade plant extract which will not stress corals like medicines, pesticides, or iodine based dips. 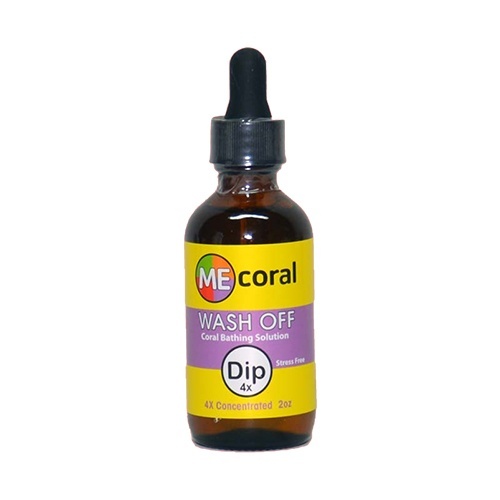 Wash Off promotes coral health and should be used to rejuvenate damaged corals or newly fragged corals. MECoral Wash Off 4X is highly concentrated having more than 4 times the strength of regular dips. Comes in an 2oz bottle. Treat your corals Kindly. Directions: Add 15 Drops (Aprox one squirt} of Dip 4X to a container with 1 guart of used aquarium seawater. Or in the bag of a newly purchased coral. Bathe corals for 5-10 minutes, gently stirring with a turkey baster, pump, or hand. Rinse well in another container of aquarium seawater before placing coral in display tank. Discard used solution. Do not allow dip into main display tank. Do not use more than the suggested dose.